Course status update: Our Half Marathon/Relay course has been sent to the USATF for Certification, and we expect the certification to take place this month. Please note: there have been changes to the 2012 course route in Oceanport (the first five plus miles) as well as a couple of minor tweaks in Long Branch, which are not storm related. Our Full Marathon course, which shares approximately the first 11.5 miles with the Half/Relay course, is almost complete (we are awaiting final approval from one town council, which should happen during the week March 4th). In addition to the changes in Oceanport and the minor tweaks in Long Branch mentioned above, there will be a tweak in Deal and major reroutes in Loch Arbour, Asbury Park and Ocean Grove. Of these the largest changes will be in Asbury Park and Ocean Grove. Unfortunately we WILL NOT be racing on the Asbury Park Boardwalk and thru the covered portion (the Arcade) this year. That reroute will cause us to enter Ocean Grove via a foot bridge over Wesley Lake, instead of via the more direct land route between Asbury Park and Ocean Grove. Additional distance will be added in Ocean Grove to make up the lost mileage in Oceanport and Asbury Park. 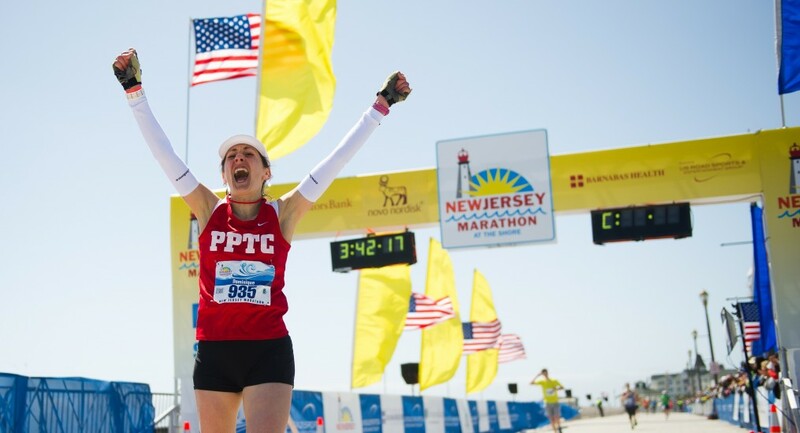 We expect that portions of our 2012 course through Loch Arbour, Asbury Park and Ocean Grove will return in 2014! We are very fortunate to have eight very supportive communities which host our courses! It is not possible to describe fully the tremendous support each of these communities has provided in moving forward during these difficult months! We are very grateful to them for caring about these events! Without their help we would have to cancel the event in 2013! We will publish preliminary course maps as soon at the certifiers have completed a “preliminary certification”, hopefully in March, and we will publish the final course maps as soon as the final, “Official Certification” as occurred and the paperwork has been completed. Fluid Stations: I am pleased to report that we will again be using Gatorade-Endurance Formula (lemon-lime flavor) at each of our Fluid Stations, with Gatorade served first and water second at each station. Most Fluid Stations will be less than 1.5 miles apart and will be staffed by many service organizations and charity volunteers. The first three fluid stations will be on both sides of the race course, so there is no need to cross to the opposite side for fluids. These dual sided fluid stations are staggered so that the middle of the course is not blocked by participants trying to take in hydration. There will also be trash bins near each fluid station for your use. Please use them for Energy Gel tops and packs, banana/orange peels, cups, general garbage, etc. Please help us to keep our neighborhoods and course as clean as possible during the races by using the trash bins as often as possible. Energy Gels: GU energy gels (vanilla bean and jet blackberry) will be at multiple locations between miles 13 and 22. Please be prepared to carry your own favorite gel packs (the ones that you have been training with), if GU is not the brand which you’ve been using. You are of course welcome to the GU in any case, but you may be jeopardizing your race if you use anything which you haven’t tested during your training. We will have over 7,000 GU energy gels on the course to service our Full Marathon participants. Bananas: Located on the course between miles 13 and 22 are a good source of potassium. Toilets: We will again provide portable toilets at the Start & Finish areas, as well as along the course. On the course they will be located at, or very near, each Fluid Station. Please do not relieve yourself on private or public property! Local Police will be called if anyone is observed doing so. This is UNACCEPTABLE Behavior which reflects badly on us all and our sport. Clocks & Mile Markers: We will have timing clocks throughout the courses, large mile markers at every mile and B-Tag timing mats at the Start, Finish and at multiple locations on the courses. During the first 11 miles of the Half Marathon & Relay and the Full Marathon there will be two sets of mile markers along the course. The two courses share the same route during those first 11.5 miles, and the mile markers will be marked “Half” and “Full”. On Course Safety: I know that many of you train with music and headphones. The organizing committee strongly recommends that you leave your headphones at home, for safety reasons, as you need to be aware of your surroundings, your fellow runners (who may be passing) and the possibility of emergency and race vehicles and even errant traffic on the course (we work hard to ensure that traffic will not get onto the race courses but it only takes one careless motorist to cause a potentially dangerous situation). Safety Flag Warning System: The Safety Flag Warning System will be used to communicate race status to all participants, volunteers and race staff with respect to weather and safety conditions. There will be a simple flag color system. Green Flag – Everything is Normal. Yellow Flag – Heat index is at a point that runners/walkers should slow down and drink plenty of water. Red Flag – Either dangerously hot weather exists and runners and walkers should slow down and take plenty of water, or lightning or tornado(s) are reported in the area and runners and walkers should take cover at the closest shelter until the course is reopened. Timing of the event has stopped and no awards will be given out at this time. Black Flag – Race has been canceled due to extreme weather or an on course emergency has occurred and all participants need to leave the course/seek shelter immediately. We hope to always have the Green Flag flying over the entire length of our courses, but should the need arise; we are dedicated to communicating race status and safety warnings to each of you in a timely, effective manner. These safety warning flags will be located near each fluid station, so please keep an eye out for them. In addition, fluid station personnel will also be reminding you of the flag colors whenever a dangerous condition exists, and they may also be directing you to the nearest shelter for your own safety. Please do not ignore these warnings! Dangerous conditions are very unusual during our race, so please remember to pay attention to them as you approach each fluid station. On Course Entertainment: as in previous years, there will be bands and DJs, etc. at appropriate places along the courses, for the enjoyment of the athletes, spectators and volunteers. Please note that we are restricted by noise ordinances in several prime locations, and along with some rerouting this year, (some permanent and some temporary), we will alter some of our previous entertainment locations. We will publish: course maps with fluid station locations and turn by turn directions, the locations of fluids/GU/bananas, etc. and a list of the entertainers and locations as soon as possible after the courses are 100% complete. BTW – I was at a half marathon today with our Street Team where one of the runners stopped by our Gatorade table for a drink and to share a story with me. He told me that he had joined us for one of our previous Hot Chocolate Training Runs, and along the course two homeowners saw his group coming down the street and yelled out to them to thank the runners for returning to train and race here at The Shore. Those homeowners reminded him and the others that it was important that we continue to support the area as it continues to recover from Super-storm Sandy. In addition, the heartfelt comments from the residents inspired this runner to register later that day in order to show his support for the area. Residents and runners supporting and inspiring each other! It doesn’t get much better than that for a Race Director!! Some of you may not have thought of your participation in our event as helping to Restore the Shore; however the millions of dollars of economic impact which our event will produce for these communities and charities is very much needed, and much appreciated. If you’d like to do even more, here’s how: Spend an extra night in a local hotel, have a great meal at a local restaurant, shop in the local shops, etc. That’s part of “Run, Rebuild, Restore”, our plan to continue to help this part of the Shore! Thank you for your support! ← The woman in the picture?